06.08.2004 - This was a very interesting job. I got a phone call from one of the apartment complexes here in Orlando that I regularly service. They usually have problems with squirrels getting into the attics of the buildings. Thus, when I got yet another call for noises in the attic, I went prepared to do a squirrel removal job. When I got on the roof of the 3-story building to inspect, I saw this! There was a large hole torn into the wall of the apartment at roof level, with a big wooden board missing. A tenacious female raccoon had climbed 3 stories onto the roof of the apartment - that's a tough climb with no trees handy! And it just ripped its way right inside the attic. Not only that, but when I started nosing around the hole to inspect, it just came right up and stuck its head out of the hole! I took a few good photos. This raccoon certainly had no fear! 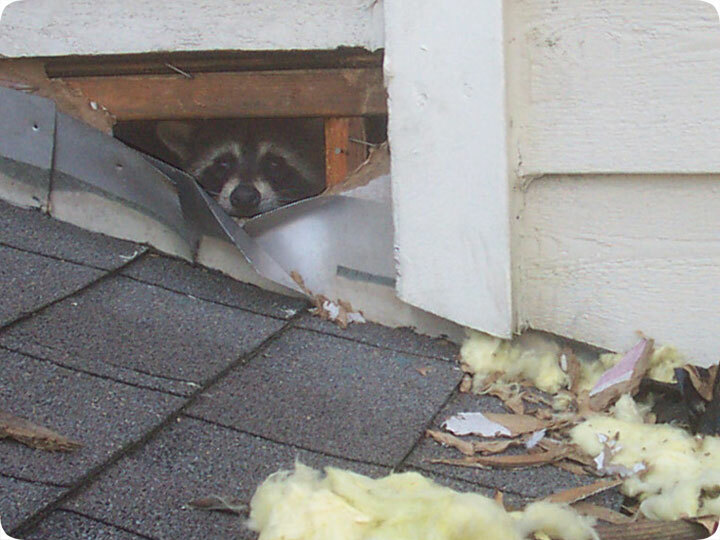 Raccoons cause a lot of damage to homes and especially inside the attic. They tear up ductwork, wires, and defecate. I have several photos of attic damage on this page: Raccoon Damage in an Attic. If you have raccoons in the attic, it's best to have them removed as soon as possible, before they cause serious destruction.